Vicks chest vaporub rub is a must have in the bathroom cabinet for when you need to clear your chest and nose during Winter and it works! I recommend this product I’ve been using it for many years, when my nose is blocked I put this in a bowl with hot water and a towel over head, this clears my nose and head so well. Always have this in my cupboard. Vicks has been part of our family for years and gets a real good workout during the winter months. It helps unblock your nose and clear your chest. I rub a small amount on the sole of my children’s feet and they wake up in a much better condition. I have never slept well and always seem blocked up so this is like my best friend. I love the strong smell and the feel of it. It has always had a place in my cupboard and always will. 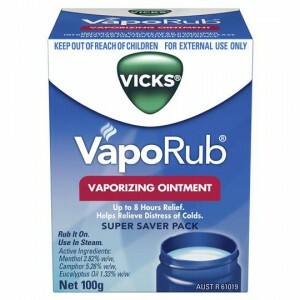 Vicks Chest Rub Vaporub has always been a reliable product and has always been used in our household. It is a staple in the medicine cupboard and always brings relief. It’s perfect for us when that nasty cold hits any member of my family. It’s perfect for clearing the nose and soothing the body. It rubs in really nicely and doesn’t attach itself to your clothes. My daughter knows this is the number one for when she’s sick. How would you rate Vicks Chest Rub Vaporub?